The U.S. may be the first to see the new supercar, American Honda&#8217;s highest-ranking executive hints. DETROIT – Confirming widespread speculation, an American Honda Motor Co. Inc. official indicates the next-generation Acura NSX will bow later than initially expected. “We are developing it without any delay, so most probably we will have it in the period we already promised,” says American Honda President and CEO Tetsuo Iwamura says, adding that means the car will arrive in 2010. However, 2010 is at least a year later than the 2008-2009 timeframe earlier set by Honda Motor Co. Ltd. CEO Takeo Fukui. Much mystery has surrounded development of the next NSX. Last January, Honda unveiled the Acura Advanced Sports Car concept at the North American International Auto Show, saying it hinted at the new NSX. Fukui told media then to expect a production version at October’s Tokyo Motor Show. But reports surfaced the auto maker was unhappy with the tepid response to the Detroit concept and sent the car back to the drawing board. 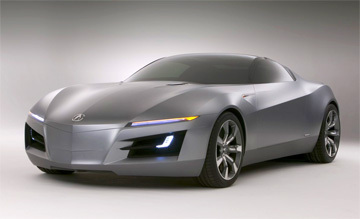 In August, John Mendel, American Honda executive vice president, told Ward’s another version of the supercar concept would bow in Tokyo, but neither a production model nor concept was shown. Over the summer, Honda announced the Acura brand’s Japan launch would be delayed at least two years due to poor market conditions. Many analysts had expected the rollout of the NSX to coincide with the luxury marque’s Japan debut in 2008. But Iwamura hints the delay may mean the U.S., not Japan, now is slated to get the vehicle first. Acura’s U.S. sales were down 10.8% through November, Ward’s data shows. “Frankly speaking, we are struggling a bit,” Iwamura says, noting model-launch cadence has been problematic, as Honda’s near-luxury brand had no new vehicle introductions in 2007. “We have to arrange a bit more wisely the timing and how we introduce new models,” he says. Last year, the brand launched the new RDX compact cross/utility vehicle and revamped MDX midsize CUV, as well as brought back the TL Type-S variant as part of that model’s midcycle freshening. The RDX hasn’t come close to its projected annual sales target of 40,000 units, but the addition of the vehicle to the lineup has added 21,093 units to Acura’s sales tally of 162,522 vehicles this year, Ward’s data show. Adding the MDX, Acura’s light-truck sales were up 35.1% through November to 73,793 units, lessening the impact of the 30.4% decline in car sales. Acura’s best seller, the TL midsize sedan, saw deliveries fall 19.8% through November, while sales of the flagship RL sedan plunged 47.4% in the period. Honda is expected to launch all-new versions of the TL, as well as the slightly smaller TSX sedan in 2008, while the RL will undergo a major freshening next year, officials have said.